Using technology and the internet introduces young people to new ideas and the skills they’ll need to compete in the global workforce. But for far too many youth, the web’s world of possibilities still remains out of reach. Around the world, rural living and poverty, poor infrastructure and health issues, and limited education all present barriers to accessing and using technology. Many young people can’t afford or access a school, and if they can that school may lack clean water, let alone computers. 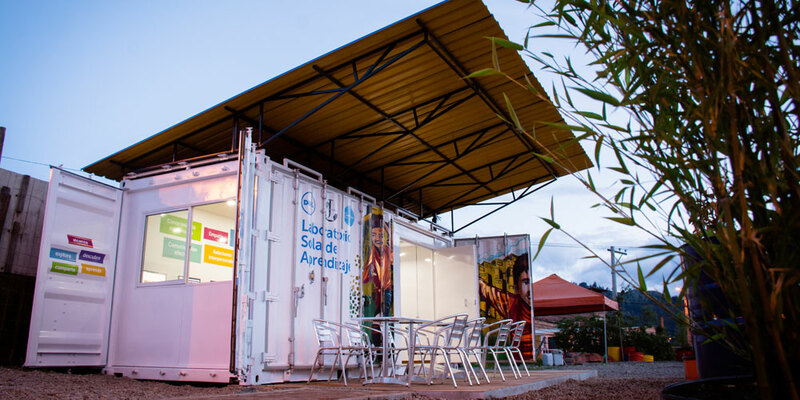 Dell’s newest solar-powered Learning Lab outside of Bogotá, Colombia. That’s why Dell is reimagining the traditional classroom model as we work toward our Legacy of Good goal of applying our expertise and technology to help underserved and underrepresented youth grow and thrive. Working with our 62 local Youth Learning partners in 15 countries, we assess each community’s unique barriers to accessing technology and then develop creative solutions to overcome them. Our local team members also volunteer with these organizations, amplifying the impact of our Youth Learning programs. I’ve had the opportunity to witness some of the challenges these communities face first-hand, in my role as Dell’s Director of Global Giving, as well as in my own travels to emerging countries. Before leading the Giving team, I was focused on growing Dell’s global Cloud Services business. Today, I see how Dell’s technology, combined with our Youth Learning programs and our team members’ expertise, make a real, positive impact on kids who otherwise would not be very prepared for our 21st century, digital world. I would like to share some examples of this impact with you. Let’s start with our record-breaking past year. In FY16, Dell set three major community service records. We logged 811,000 hours of volunteer time, team members from 66 countries volunteered, and our service positively impacted 26,000 charities worldwide—our highest annual totals since we started tracking volunteerism in 2006. Volunteering helps team members gain new skills and insights they can use in service to our customers. In fact, one of our most successful giving endeavors—our solar-powered Dell Learning Labs—started as an idea from a Dell volunteer. In many developing countries people still lack affordable, reliable electricity. In Nigeria, South Africa, and Colombia, we’ve bypassed this issue by creating 11 solar-powered Dell Learning Labs. The labs are housed in well-lit, well-ventilated shipping containers outfitted with solar panels, a steady Internet connection, an air-cooled server, and Dell Wyse™ thin clients. This solution uses less than 4 percent of the energy of a typical PC. Dell Learning Labs have become a community fixture where students can progress from basic computer literacy to graphics and coding under the instruction of Dell’s local Youth Learning partners. Dell volunteers have worked onsite at these labs to install equipment, provide training to teachers, and more. Manrique-Hyland was looking for an opportunity to volunteer with her Dell team, but was challenged by family and career commitments that made for packed days. So she and her employer came up with an idea: give her time and talents right from her desk and during work hours. “I work from home and I wanted an opportunity to give in a meaningful way – but virtually, and I knew other people I work with want the same. We’re in Beijing, Ireland, and Brazil,” Manrique-Hyland says. Manrique-Hyland launched Dell’s virtual mentoring pilot program with our partners, Sci-Bono, who manages some of the Dell solar-powered Learning Labs in South Africa. Through phone calls, video chats and emails, Lori and other Dell volunteers from around the world mentored Sci-Bono’s teachers to help them enhance their technology skills. “Now, giving your time and talents from your office is another way to volunteer. At the other end of virtual mentoring are people you are truly helping,” she says. To help our partners more—virtually—my team is now working to make sure our community service strategy will provide Dell team members with more virtual, skills-based opportunities. In rural Morocco, both connectivity and distance are barriers to educating youth. There we work with our partner Bayti to bring a mobile IT Caravan – a bus outfitted with a Dell technology lab – to remote villages. Dell employees also serve as facilitators to help community members learn how to use technology. In India—where over 1.2 billion people compete for jobs—our Youth Learning partner, Learning Links Foundation, is leveraging Dell tablets and cloud computing to provide educational programs to over 72,000 students across India, many with parents who bring in less than $100 a month. In 2014, more than 3,400 Dell team members volunteered at schools, creating a more interactive learning environment through activities such as classroom makeovers. Additionally, team members used their volunteer rewards (charitable contributions they receive from Dell for volunteering) to fund the installation of solar panels at two schools. To learn about other ways Dell’s Legacy of Good goals are paying off for customers, communities and the planet, visit www.dell.com/legacyofgoodupdate.